An excerpt from Madiou’s Histoire d’Haïti, volume 8. 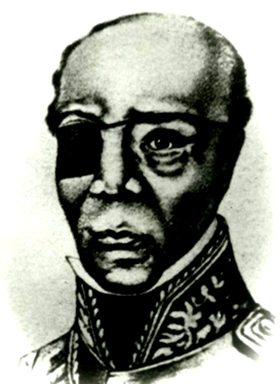 Madiou was one of Haiti’s earliest and most prolific historians. The rivierist party was in ruins. But the citizens and the soldiers who had contributed the most to the fall of this faction started to actively collaborate to overthrow the [succeeding] government. In Port-au-Prince, General Riché, General Dupuy who had led Guerrier’s cabinet, and the colonel of the artillery, Fils-Aimé, conspired [against President Louis Pierrot] with perseverance and shrewdness, even though Generals Lazarre and Samedi Télémaque kept a close eye on them. Discontent was expressed elsewhere; the [carnival] masks mocked Pierrot; they imitated his voice, his gestures, and his walk. People waited impatiently for the signal for revolt which was given in Saint Marc. The conspirators in Saint Marc took advantage of the mobilization and departure of the soldiers. 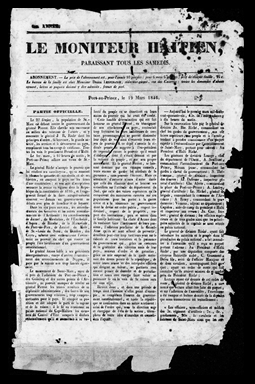 On February 27th the people, the third artillery regiment, the seventh and eighth regiments, the gendarmerie, the twentieth regiment, and the cavalry lined-up along the Place d’Armes to announce the fall of Pierrot and proclaim Riché as President of Haiti. At precisely ten o’clock, the National Palace was crowded [with those who had rebelled against Pierrot]. Generals Lazarre [… and] S. Télémaque were spotted among the participants. General Riché brought the large gathering into the great hall of the Palace where he presented himself to them and delivered an address as the President of Haiti. Immediately, patrols spread through the city proclaiming the new president. Meanwhile, President Riché focused all his attention on Acaau and sent numerous troops led by General Samedi Télémaque to fight him General Riché had no doubt that Acaau would resist his accession to power. Télémaque quickly advanced on Anse-à-Veau at the head of the army from Port-au-Prince. The fort where Acaau had retreated was surrounded, bombarded, and then assailed. Unable to maintain his position, Acaau withdrew into the woods. Hunted from all sides, he resorted to [suicide].